More info - More work! Less pay! Short answer: in February 1977 the Communist union leader Luciano Lama held a public meeting at the University of Rome, which was occupied by students; he told them to get back to their studies and not to be so lazy and self-indulgent. This didn't go down well. "More work! Less pay!" ("Piu` lavoro! Meno salario!") was one of the slogans that were chanted at him. That was the short answer? What can I say, I'm an academic. I love that slogan because it encapsulates so much about the period. "More pay! Less work!" had been one of the key slogans of the 1969 strike wave known as the Hot Autumn; it's a very fundamental demand, when you look at it, and quite an attractive rallying-cry. The Communist Party had been behind the strikers then, more or less; they'd certainly been happy to take the credit for their victory. Eight years on, the Communists were in search of respectability, which meant telling bolshie students to get back to work and telling trade unionists to moderate their pay claims and be more productive. In other words, to do more work for less pay. And they were up against a protest movement with no scruples about throwing it in their face, and with enough humour and creativity to do it in style. It's a fascinating period. That's a version of this image. I originally wanted something by Tano D'Amico (who took pictures at the Lama meeting), but the budget wouldn't stretch, sadly - even to the solidarity price Tano's agency came up with. Why two people grasping a tomahawk? Well, the Native American image (as we didn't then call it) was very big in the more radical parts of the movement: the people heckling Lama actually called themselves "Metropolitan Indians". No, I'm not making it up! There's just very, very little in English on any of this stuff. The whole period's half-forgotten even in Italy, although there at least some of the participants try to keep the memories alive. No, not really. What I describe in the book is a "cycle of contention" (Sidney Tarrow's term) - a series of social movements taking cues from one another, spreading and branching out into different areas. Tarrow's original model of the cycle suggested that a cycle declines when its contributions are absorbed into mainstream politics, leaving the activists satisifed and the diehard leaders washed up. My reading of the 1973-79 cycle is that it went into decline when it was comprehensively suppressed, both forcibly and ideologically - leaving the entire movement washed up, or in many cases behind bars. The 'movement of 1977' - the last and biggest of a series of waves of activism which had begun around 1973 - was repressed and criminalised, not necessarily in that order. And as a result it's now largely forgotten - or else remembered as a curiously widespread outbreak of nihilist hooliganism. The Italian Communist Party gained enormously from its engagement with the Hot Autumn, just as Tarrow's model would suggest. Its engagement with the movements of the second cycle (1973-77) cost the party very dearly, sending it into a quest for centrist respectability which was bound to lose it support, and from which the party never really recovered. 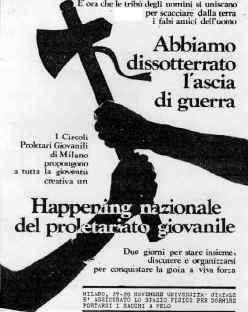 And what about the Red Brigades? There's stuff in there about them too, but this Q&A is long enough already. Let's just say that the way a respectable Left-wing party deals with terrorists may be quite closely linked to the way that it deals with radical competitors: respectability may seem to call for a hard line in both cases, but in both cases the hard-line approach may not be the most productive. And finally, the most important question: is there going to be a paperback? Only if the hardback sells out, apparently. So, friends, librarians, eccentric millionaires, buy now! And friends, reviews editors, lecturers who might consider a course adoption, request now!